For centuries, healers have turned to the alfalfa plant as a naturopathic treatment for several common ailments. Although alfalfa supplements have been the subject of only limited scientific inquiry, preliminary evidence suggests that it can help prevent or treat several diseases and conditions. Aqueous and ethanol-based extracts of alfalfa offer a concentrated source of the plant's natural medicinal compounds. Consult your health care provider before using any nutritional supplement to treat a medical condition. Alfalfa extract offers a concentrated source of several micronutrients, or vitamins and minerals. 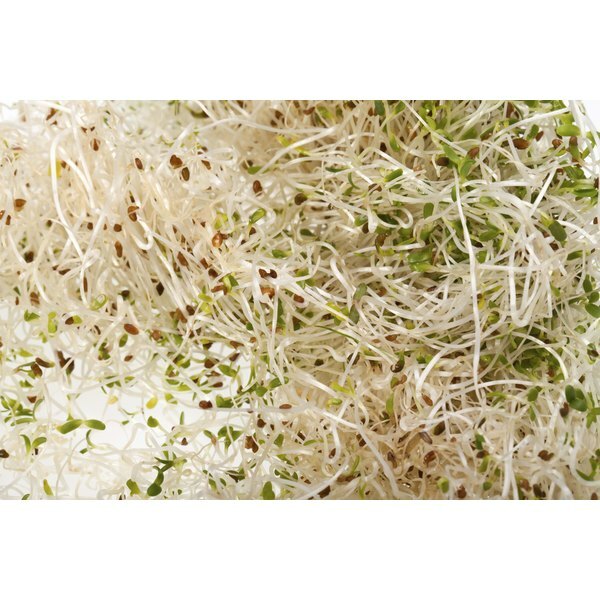 According to NutritionData, an online service provided by "Self" magazine, sprouted alfalfa seeds are an excellent source of vitamin K, which is essential for normal platelet function. Alfalfa extract also contains six B-vitamins, vitamin C and beta-carotene. Because of alfalfa extract's high vitamin K content, it is not an appropriate supplement for people taking anticoagulants such as warfarin. Alfalfa extract may offer benefits to women suffering from hormonal imbalances, infertility and problems with lactation. According to the NIH, alfalfa contains natural plant compounds that are chemically similar to estrogen. The NIH acknowledges alfalfa's theoretical and traditional use as a menopause remedy, breast cancer treatment and uterine stimulant. However, no studies have confirmed its safety or effectiveness for any of these conditions.